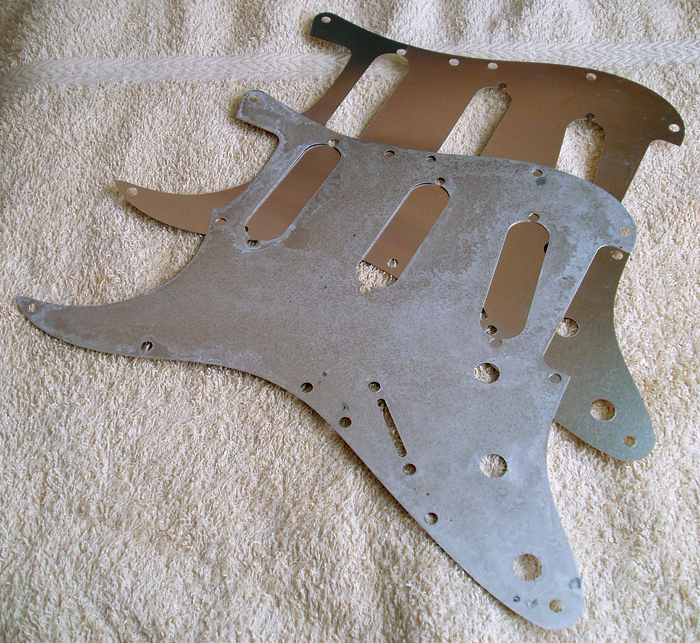 In part one of this project series, I identified all the components and parts needed to put together an early-60s style Stratocaster pickguard assembly. I also discussed how certain parts, such as the metal shield, potentiometers and capacitor value, all have a noticeable effect on tone. With the theory out of the way, we can finally get around to the fun part. 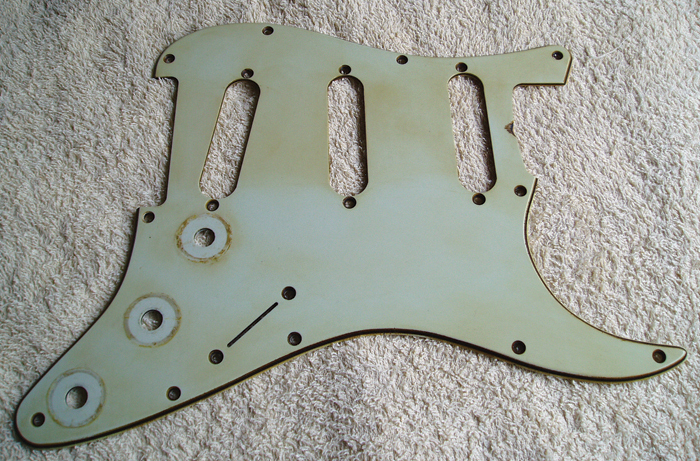 To finish off this project, I’ll be investigating various ageing and distressing techniques, before putting everything together and installing the loaded pickguard onto a guitar. Groovy Guards ship with protective plastic film on the front and back. Since the backs of vintage pickguards tend to be cleaner and lighter than the fronts, I opted to leave the rear film in situ while I worked on the front and sides. The first task was to replicate the little chips and dents that are usually seen around the bottom edge of old guards. I simply tapped away with a kitchen knife, taking care not to overdo it or to cut too deeply . Next, I softened the top edges above the pickups and in the treble cutaway, rolling them over using a Stanley knife blade as a scraper, before feathering it in with some 4,000 grade Micro-Mesh. The truss-rod scoop of Fender pickguards usually looks pretty gnarly and misshapen after 50 years of adjustments, so I used a needle file to score some gouge marks and introduce some irregularity to the shape. The edges of the Groovy Guard looked slightly too smooth, due to a near-total absence of router bit chatter marks, so once again I used a file, working my way all around the guard. 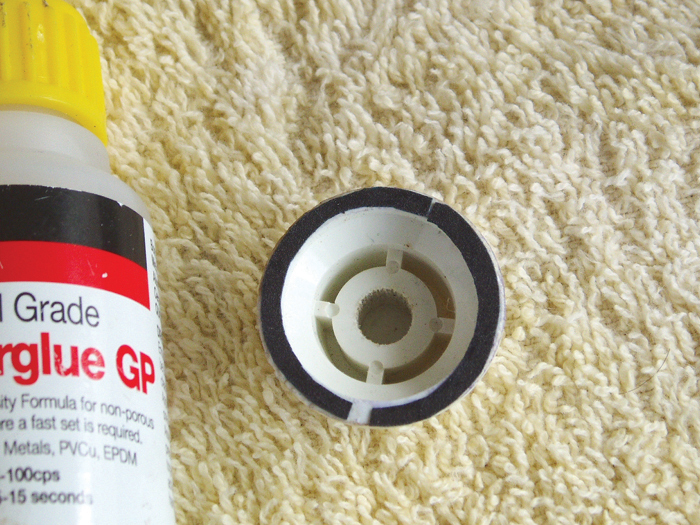 Care should be taken if you try this because celluloid is quite soft, and you should avoid cutting too deep and narrow. Filing the guard produced a fair bit of dust, so I decided to test that it was indeed celluloid. In fact, I could tell from the smell, but when I piled up some dust and held a match to it, the resulting burst of flame eliminated any doubt. I wouldn’t recommend trying this yourself. 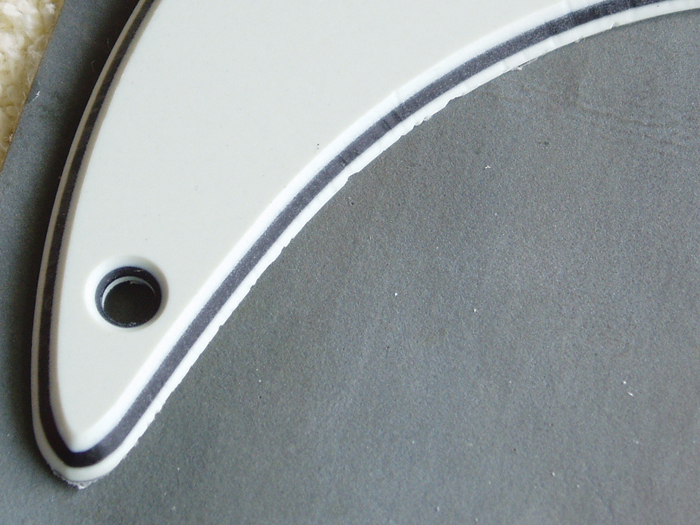 Replicating the control knob gouges was always going to be tricky, and you often see elliptical or off-centre marks in aged pickguards. I installed a control potentiometer in the volume position, then stuck cut pieces of 600 grade abrasive paper to the underside of a cheap control knob using Superglue. I then pushed it down until it made contact with the guard, and rotated it to create scratch marks on the surface. I repeated the process for the other two controls . At last, it was then time to address the colour issue. In its natural form, the Groovy Guard has a greenish hue with some blue. After masking off the areas under the control knobs, I dissolved a few drops of ColorTone Vintage Amber stain from Stewart MacDonald in some isopropyl alcohol and wiped it onto the guard. Although I started with a weak mixture, the guard began to take on a darker and greener appearance almost immediately. It was a good start, but the guard needed to be darker and browner to look authentic. So I added a few drops of ColorTone Medium Brown to the mix and persevered. 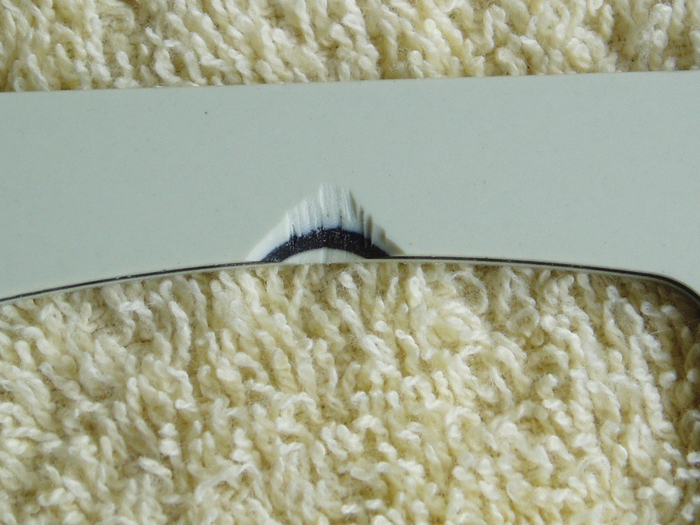 Although well-used pre-CBS guards tend not to have a uniform colour, you don’t want a guard that looks blotchy. I found I could feather the darker areas into lighter areas using 3M Machine Polish. This stage took quite some time and a lot of buffing, but I was pleased with the end result. Once that was done, I had to add some dark brown dirt to all the edges and the screw countersinks. Past experience had taught me that Morrells naphtha-based Dark Oak Grain Filler is perfect for the job. Its ability to stick to anything and the difficulty of removing the stuff makes it horrible to use for grain filling, but absolutely ideal for simulating the appearance of decades-old crud. After removing the protective film, I did very little work on the rear of the guard, save for applying a weak Vintage Amber stain around the edges and some slightly darker stain around the switch slot and the areas around the pickup height adjustment screw holes. I didn’t want to dull the sheen on the front of the guard, because originals tend to be fairly reflective, but I did give it a thorough going over with a brown shoe brush to add countless randomised and superficial scratches. It is possible to buy distressed shield plates. Non-distressed ones are a lot cheaper, but the aluminium tends to look very bright and shiny. Unfortunately, aluminium doesn’t react to the usual metal ageing techniques – such as the battery and salt water method, or PCB etchant. 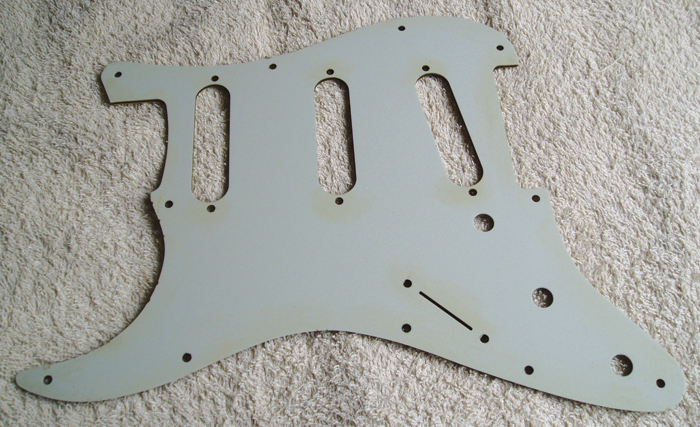 If you want to knock off some of the shiny newness, try running the pickguard through a few dishwasher cycles. After much research, I bought a bag of trisodium phosphate crystals via eBay, added them to some very hot salty water then soaked the shield for a few hours. It may help if you lightly scuff the shield’s surface with ultra-fine wire wool before treating it. The old shields tend to look grey at the edges, and have a white-ish powdery quality. My efforts certainly took off some of the newness, but I couldn’t claim complete success. However, nature may work some magic now that the ageing process has been kickstarted, and I look forward to seeing how the shield will look after a year or so. Thanks to the covers, the only parts of the pickup that will ultimately be visible are the tops of the slugs. 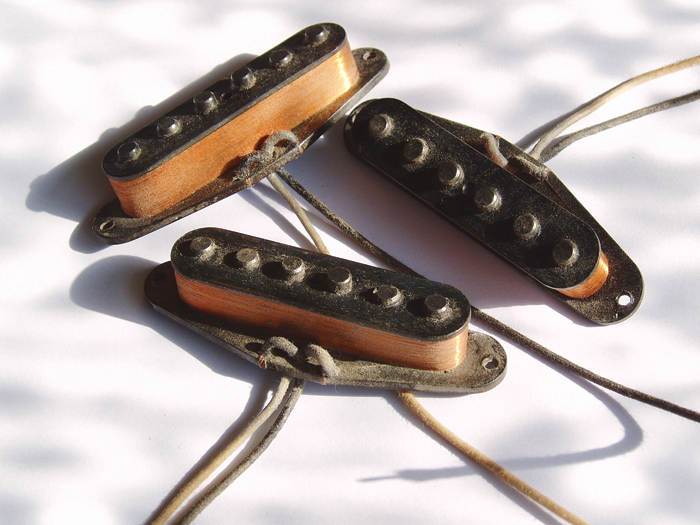 Opinions may differ, but in my experience old Strat pickups rarely look rusty, and if they are rusty it doesn’t bode well; they’re more likely to have a dark grey and uneven patina – and you can replicate this by using special metal paint. I bought a flat black Birchwood Casey Super Black Instant Touch-up Pen on eBay for just less than £7, and its chisel-shaped tip makes it ideal for this application. The paint dries fairly quickly, so work on one slug at a time. I applied the paint to the sides first and lightly dabbed off the excess with a cotton bud, then I repeated the process on the top. After a couple of goes, you should get the hang of it; and once all 18 slugs are done set the pickups aside for 10 minutes or so for the paint to dry off. It may look a bit glossy at first, but will appear dull once it has dried. When new, the cloth-coloured wire looks far too bright. I diluted some ColorTone Vintage Amber die in isopropyl alcohol and wiped it onto the black and white leadout wires. Isopropyl alcohol is preferable to water because you don’t want the wires inside the cloth covering to oxidise . By this point, the slugs and the cloth were looking a lot better, but the pickups still looked too new. Old pickups tend to be covered in dust, so I co-opted Occam’s Razor and concluded that the best way to simulate the look was to cover the Montys in dust. Unfortunately, fairy dust is hard to obtain and prohibitively expensive, so these were given a dip in the Dyson instead. In all likelihood, any vacuum cleaner bag should contain ample quantities of suitable material. 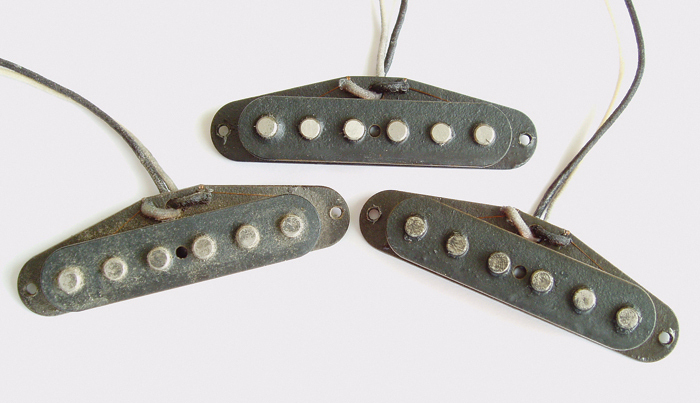 Once you pull out the pickups, blow off any excess dust and place the covers over the pickups. Pinch some dust between your fingers and rub it into the black and white wires. Take another pinch, then sprinkle it over the tops of the slugs and use your fingers to force the dust into the gaps between the slugs and holes in the covers. Lastly, deposit a bit more dust over the area where the wires push through the baseplates and you’re done. 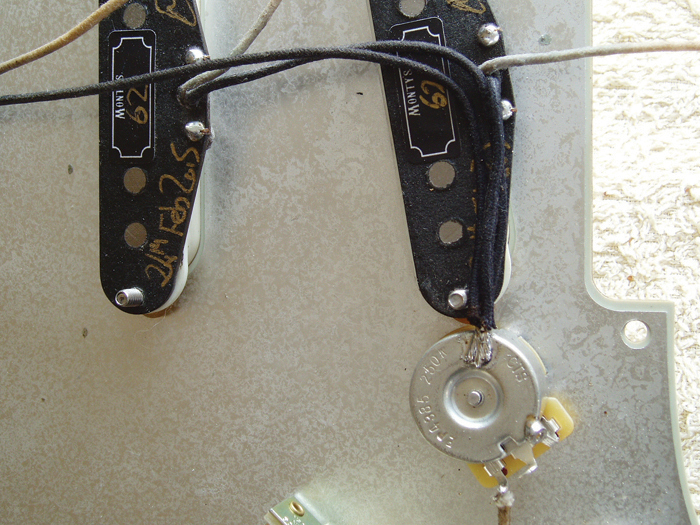 Back in the day, Fender used short lengths of surgical tubing as pickup spacers. It must have seemed like a clever solution, because you can place the pickup screws through the pickguard, push the tubing over the screws and, as long as the tubing is tight enough, the screws will hold in place. This makes it considerably easier for a single pair of hands to load the pickups onto a guard. However, if the inside diameter of the tube is too narrow you’ll find it hard to push the spacers over the screws, and even harder to tighten them up. The downside of tubing is that it perishes very quickly – either going rock-hard and losing all elasticity or rotting away to a gooey mess. This probably explains why Fender started using springs instead; but, believe it or not, some people claim they sound different. Stay with us… the theory is that tubing has a dampening effect on pickup microphony, which may or may not be a good thing depending on your playing style and sonic tastes. Even so, the purpose of this project is to recreate an early 1960s guard, so I made a mental note to test the spring theory some other time and went ahead with the surgical tubing. You can buy short pre-cut lengths from guitar parts suppliers, or buy longer lengths from non-specialists. 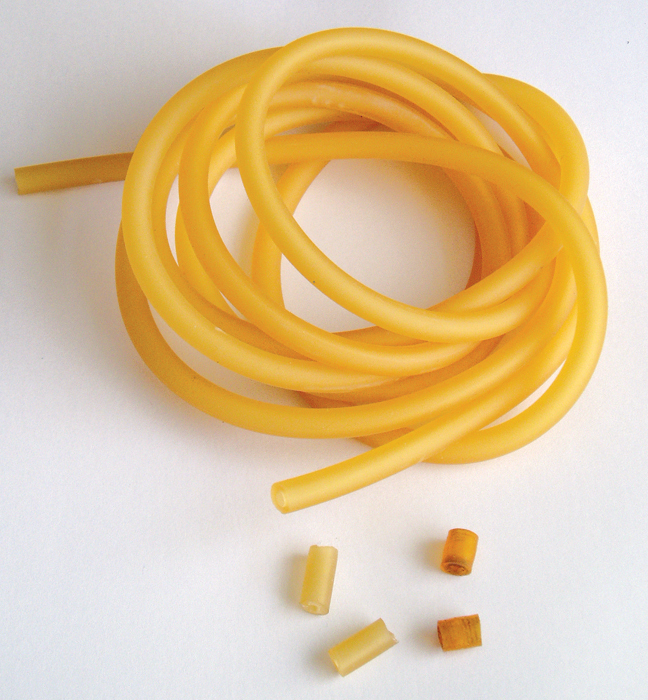 They usually advertise the tubing for use with slingshots, and you can buy a lifetime’s supply for less than the cost of six small offcuts. 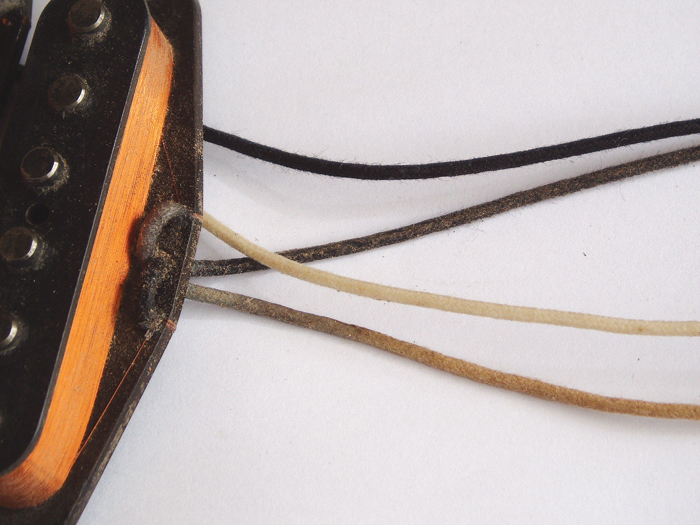 As Fender’s tubing aged, it turned a darker amber colour. Once again, Stew Mac ColorTone dyes can be used to ‘age’ the spacers. 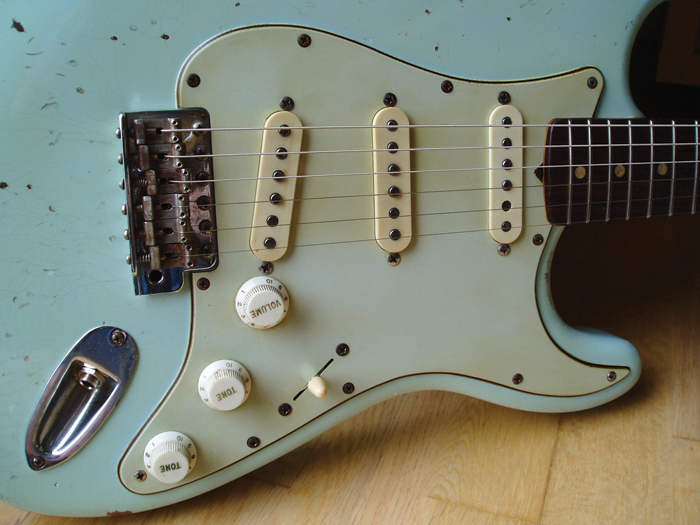 If you’ve had your Strat for a while, the pickguard and pickup screws might already look the part, but if they’re too bright and shiny it’s easy to age chrome-plated parts electronically. Simply hook up a nine-volt battery clip to a nail (or some such) on the negative terminal and a screw on the positive. Fill a small vessel with very salty water, place the nail into the water then dip just the head of the screw into the water. It should bubble and fizz like crazy. After a few seconds, remove the screw and check its appearance. This process works quickly, so keep checking and once you’re pleased with the look, set the screw aside on a square of kitchen towel to dry off and move on to the next one. Nickel can be aged in the same way, and the process works even faster. Alternatively, dipping nickel parts in ferric chloride (aka PCB etchant solution) also works well. Make sure the part is clean and completely grease-free before you do this, and wear rubber gloves, otherwise you’ll end up etching your fingerprints onto the metal. It takes a matter of seconds, and the part must be washed in water to halt the process. 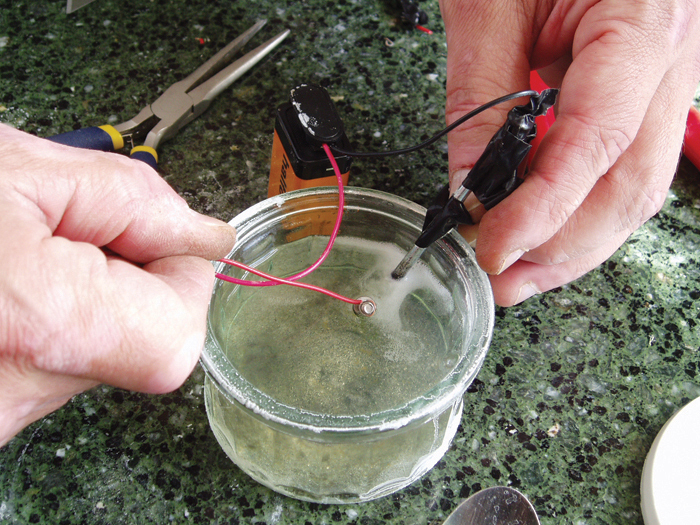 Immersing potentiometers in salt water or ferric chloride will destroy them. You can probably make pots appear older by removing the covers and treating them with the PCB etchant method, but you have to draw the line somewhere, and distressing pots and switches seems to be an appropriate juncture. At the point at which you are artificially ageing parts that can’t be seen when the guitar is assembled, purely for aesthetic reasons, it might be a sign that it’s time to climb back out of the rabbit hole. 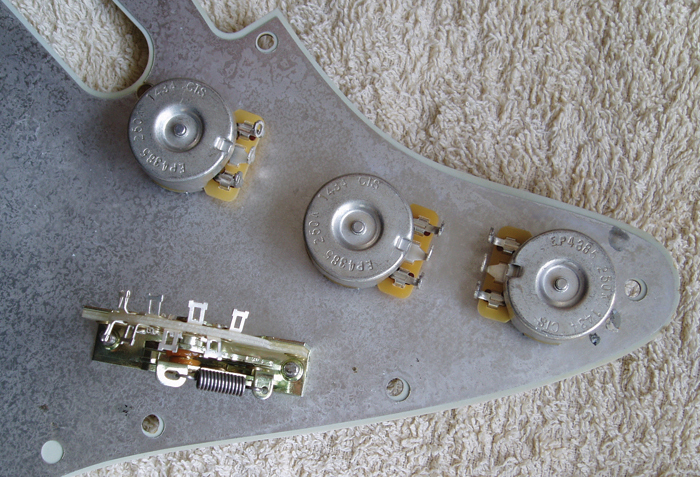 Annoyingly, five-way Strat switches tend to come with screws that have domed heads, and pickup screws are often the same. For the 60s look, you really need “raised countersunk” (aka Phillips ovalhead) screws for both applications. Even more annoying is the fact that these screws are often made from stainless steel – which strongly resists all the usual ageing methods. 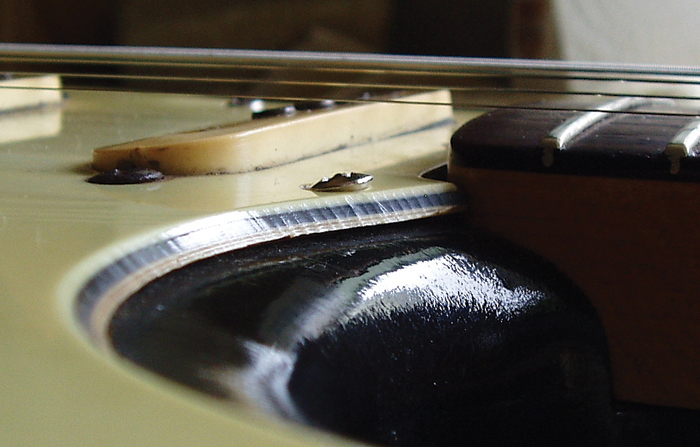 Fortunately, the correct screws are available from various guitar parts outlets and specialist screw suppliers. For pickups, you need 5/8-inch screws with a 6-32 thread. You can use the same for the switch, or use shorter 6-32 thread screws. If possible, buy chrome or nickel if you plan to age them. Sometimes, it’s easier to understand something by seeing it done rather than reading about it. With that in mind, we’ll cover the final assembly with a series of pictures and captions that will guide you through the process step by step. 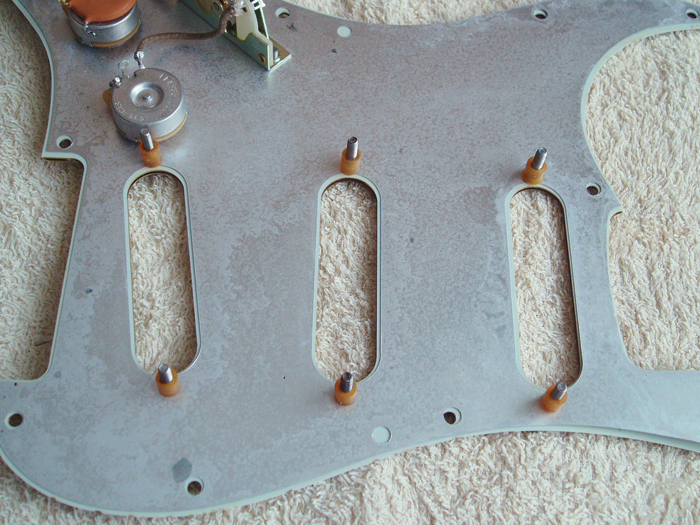 Place the shield onto the back of the pickguard and load the three potentiometers and switch. Align the shield with all the screw holes and make sure the switch is able to move freely before tightening everything up. I used a ceramic capacitor that was very slightly oversized. The yellow shielding was stripped from a length of spare cable and slipped over the leg of the capacitor. 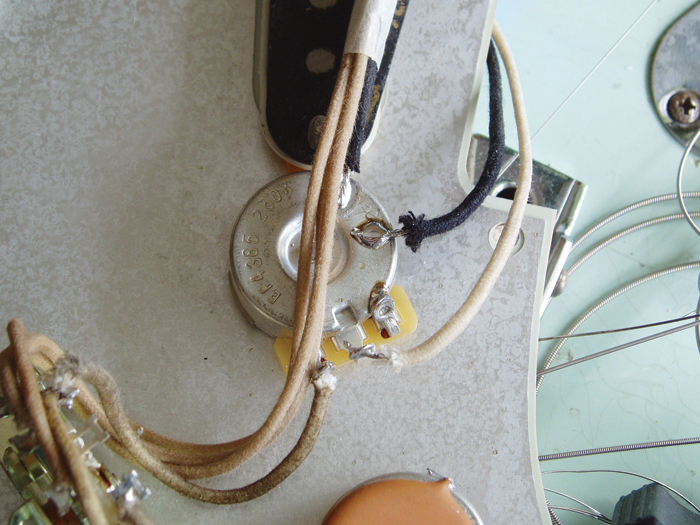 Once the cap had been soldered into position, I soldered the link wire onto the switch and the three leadout wires to the tone controls and the volume control. Note how the upper lug on the volume pot is bent over and soldered onto the body of the casing. Push the tubing spacers over the pickup screws to hold them in place. 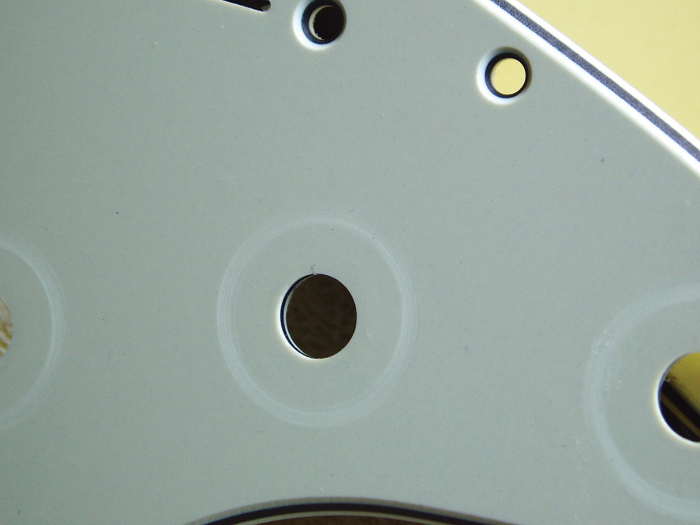 An internal diameter of approximately 3mm is about the right size for the tubing. 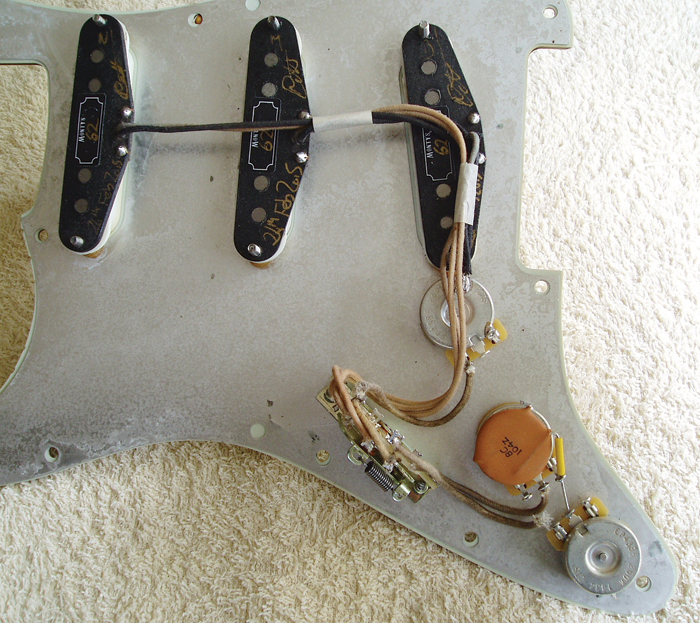 Mount all three pickups onto the pickguard, pull the hot (cream-coloured) wires off to one side and route all three of the cold (black) wires to the volume control, making a neat right-angled bend under the bridge pickup. Next, snip the wires so that they extend just over the edge of the potentiometer, push back the cloth to expose the wires, tin them if necessary, then solder them onto the casing. You’ll need a very hot iron for this, and I also use a large flat-head screwdriver to hold the wires in position while the solder joint cools. Taking care not to mix up the cables, I soldered each of the pickup’s hot wires to the switch. Fender used to route the wires in an elegant curve, so I attempted to replicate that method. You’ll need to cut the wires to length to achieve this look. Lastly, the two leadout wires to the output jack were connected to the centre lug and casing of the volume potentiometer. 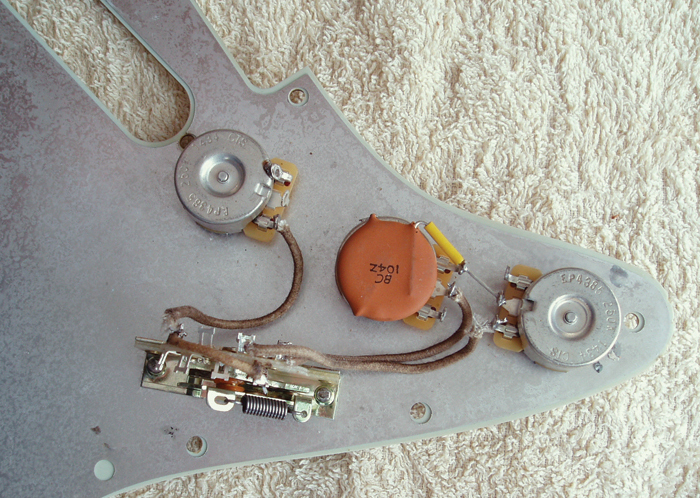 The ground wire from the spring claw was soldered directly to the output jack’s sleeve connection in the vintage style. If you think some of this is lunacy, you’re probably right. Even so, I had a lot of fun doing it, and learned a thing or two in the process. 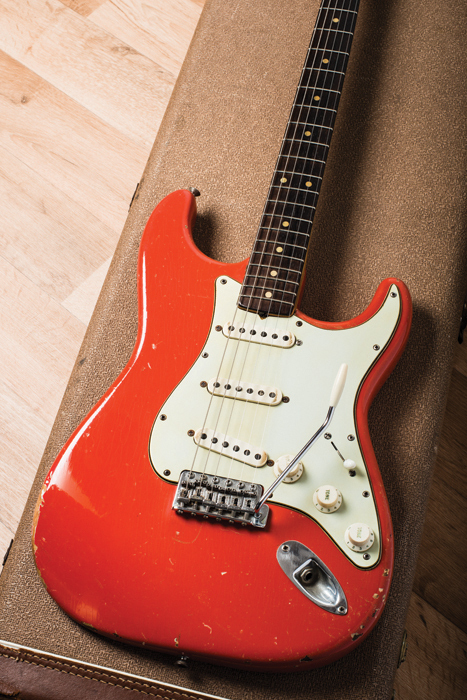 Whether you want to age your favourite Strat or restore a vintage instrument, now you know how to make it look and sound right, and you can pick and choose which bits to try for yourself. Good luck and please write in to let us know how you get on.